(May 10) - The Pompeii Antiquarium (pictured) has reopened. Many archaeological sites are giant outdoor museums, themselves, but many of them also have indoor museums to go along with them. Pompeii was one of those. It opened the Antiquarium in 1861 and for many years it was renowned for its displays, including the plaster molds of victims from the eruption that destroyed the city in 79 a.d. The museum was destroyed by bombing in WWII but managed to reopen in 1948. It was then closed in the wake of the Irpinia earthquake of 1980 east of Naples, which rendered a great number of buildings well beyond the immediate area unsafe. (The earthquake was centered 80 km/50 miles to the east.) The museum has reopened with the latest in modern audio-visual displays, a bookshop, and all the amenities for those who are tired of slogging through the site in the summer heat. 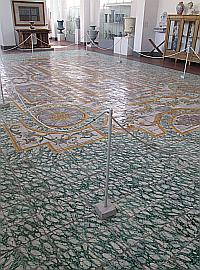 It features a permanent exhibition dedicated to the places of worship in pre-Roman Pompeii. (May 12) - Speaking of Pompeii: Giuseppe Fiorelli (pictured) (Naples 1823- Naples 1896) is best remembered as the inventor of the process for making plaster casts of the victims of the famous eruption. That process was to pour plaster of Paris into the cavities left after the corpses of the victims covered in ash had rotted away, thus producing plaster replicas of their positions at their final moment. That revolutionized archaeology at Pompeii because you can use the same process for any organic object, such as pets and even wooden tables and chairs. You can build up a picture of the way the people lived. It strengthened the position of those who felt that sites should not be broken up and items simply moved away for study (which had been the norm) but studied as much as possible on-site, now the accepted approach. Fiorelli did the first large-scale precise mapping of the Pompeii site, cataloging and ordering everything and is responsible for eventually opening the site to visitors. He held various posts in his lifetime: Professor of Archaeology at the university of Naples, Director of the Archaeological Museum, Director of the excavations at Pompeii; as well, he founded the Archaeology School at Pompeii, which then became the Italian School of Archaeology. He founded archaeological journals and also founded the San Martino Museum in 1866. (May 13) - photo of the day 10 - This mosaic is within the tiny church of the Most Holy Redeemer on the street named Corso Vittorio Emanuele in the Chiaia section of Naples. The architectural style is described in sources as "eclectic", but the tiny interior invites comparison with Greek Orthodox churches or as least paleo-Christian churches; that is, the small distance between the entrance and altar compels a sense of intimacy. 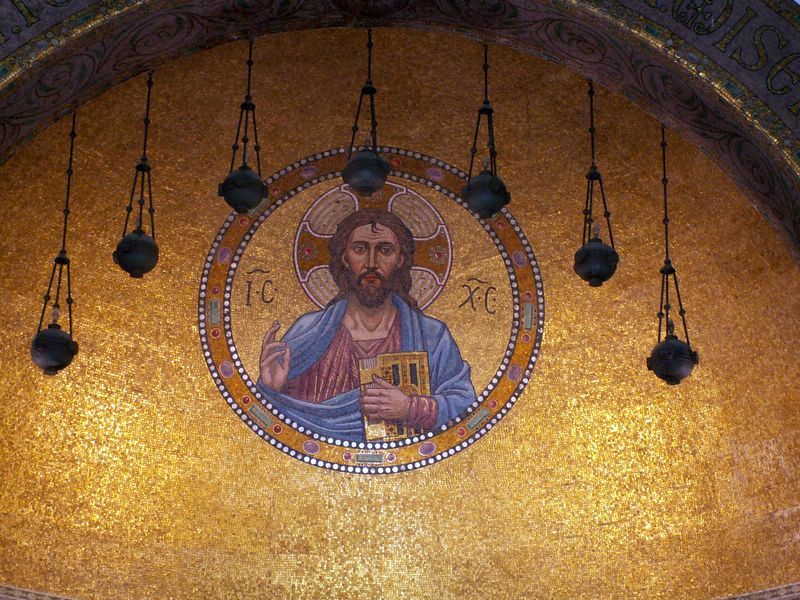 The most visible item in the church is this large golden mosaic of Christ behind the altar. It, too, suggests Byzantium. This photo is from album 1 at this link. Click here for a larger image and link to explanatory text. Here are two examples of Art Deco graphic style. It came in before WWI and became international by the 1920s and '30s in architecture and posters such as these ones advertising hotels. 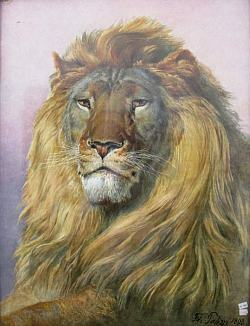 Both may be dated to about 1930. The style emphasizes bold colors and geometric shapes that are stylized to be simple and are viewed as an embrace of technology. 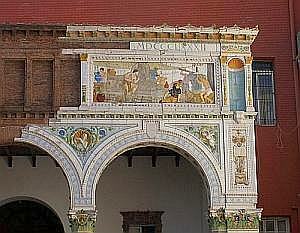 Examples of this style in architecture in Naples may be found in the entry on the Principe di Napoli gallery. 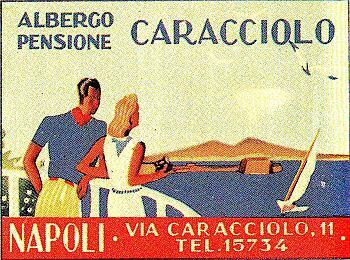 The poster on the left is for a hotel right on the seaside road, via Caracciolo, across from the Mergellina boat harbor. The hotel no longer exists but others have taken its place in the same row of buildings. They are very popular. 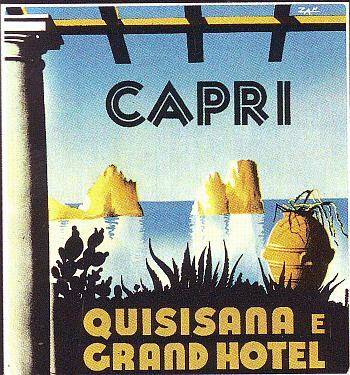 The poster on the right is for a hotel on Capri that has also changed names over the decades. 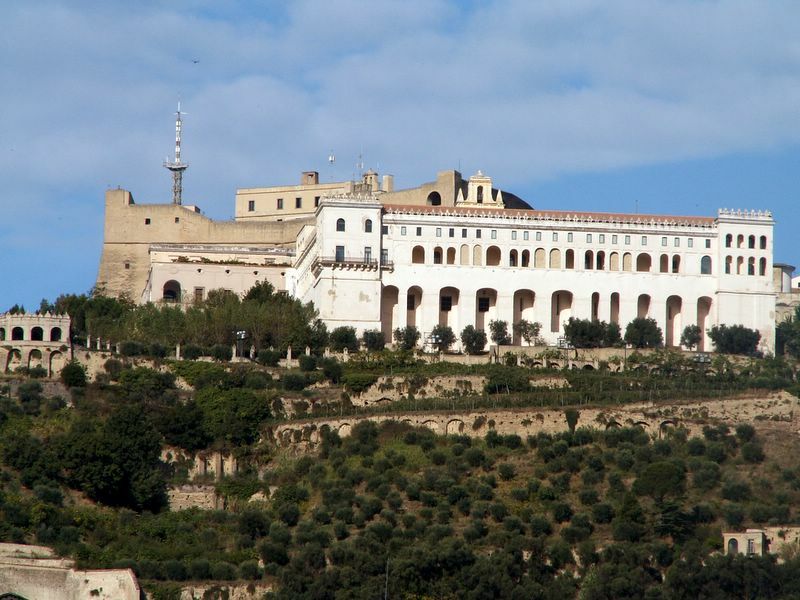 The strange name, Quisisana, originally applied (and still does, really) to one of the earliest royal residences in southern Italy, located at the beginning of the Sorrentine peninsula, above the town of Castellammare. The name apparently derives from Qui-si-sana (“Here you get healthy”). My thanks to Peter H. for providing me with these images. the Pannarano WWF Oasis "Montagna di Sopra"
(May 22) - This World Wildlife Foundation Oasis is within the boundaries of the Partenio National Park in the province of Benevento (the patch of dark green on the map) between Naples and Avellino). The Oasis is 312 hectares (770 acres) in area and is spread over a range of altitude from 800 to 1600 meters (2400-4800 feet). 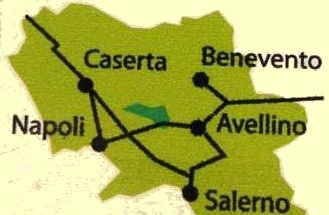 It is accessible from the province road (SS 374) that passes (in the direction of Benevento) through the towns of Ospedaletto d'Alpinolo, Summonte, Sant'Angelo a Scala, and Pietrastornina, running along the lower part of the slope of the Avella Mounts; then, beyond the town of Pietrastornina, you come to the town of Pannarano, the most reliable point of access to the Oasis. There is a marked ("WWF") road from Pannarano up and back to the west for 8 km to a location called Acqua delle Vene and the entrance to the World Wildlife Foundation Oasis of Montagna di Sopra (lit. the Mountain Up at the Top). It is typical of the WWF Oases in Italy in that it attempts to present flora, fauna, and things of geological and general natural interest through a series of well-planned instructional aids, hiking trails, guided tours, etc. The landscape is generally Mediterranean and specifically Apennine. There are, in this case, some important underground limestone structures such as the Mattiuccio grotto. Wildlife even includes the Apennine wolf! There are eight hiking trails ranging from easy to difficult. It is a paradise for bird watchers and the Oasis even organizes hill-climbing foot races (during which they let the wolves loose just to encourage stragglers!) (Don't be foolish. Watch the birds.) There is a Visitors' Center with parking near the entrance to the Oasis. (This entry is doubled as a separate box in the entry on the Partenio National Park (linked above). 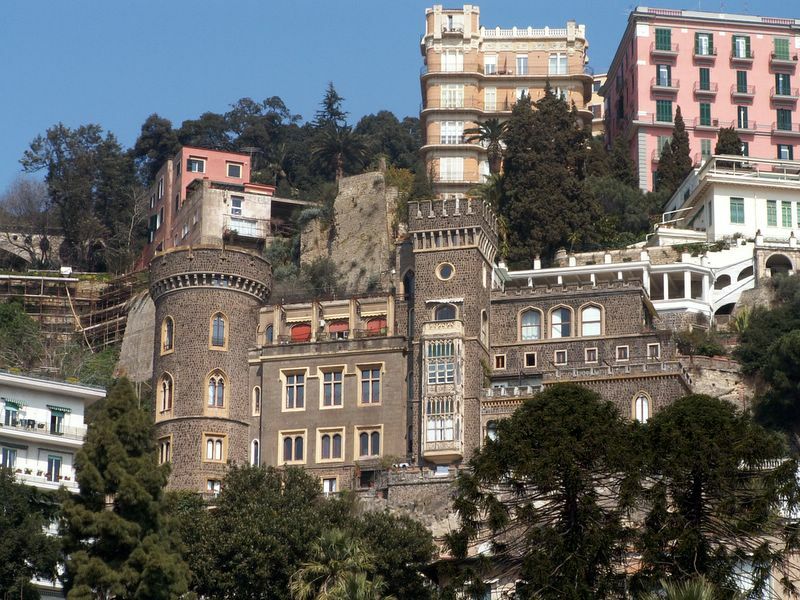 (May 24) -photo of the day 12 - This is one of the "castles" built by the Neapolitan architect with the English name, Lamont Young (1851-1929). (Details on his life and work are at this entry.) This particular building is at Corso Vittorio Emanuele 166 in the Chiaia section of Naples and is from the year 1902. It is called the "Aselmeyer Castle" (after one of the early owners). Although Young designed more traditional buildings, as well, this one and a few others like it are what one remembers about his architecture and, indeed, his vision of the city—at the time, largely rejected as not really Neapolitan, too "eccentric" and what have you. The delightful building directly above it is the Palazzina Russo Ermoli, one of the outstanding examples of "Liberty" (alias Art Nouveau) architecture in Naples. This photo is from album 1 at this link. Click here for a larger image and links to more text. The "Telephone"...indeed a strange name for a mountain peak. The first question that pops to mind is, What did they call it before 1849 when Meucci was not yet aware of what might come from his experiments in electrotherapy. Mt. “Telephone” is one of the peaks of the Lattari chain; it's located along the ridge, which runs north-south separating the Tramonti valley from Cava dei Tirreni. From the very top you have a 360° view and can admire such distant points as Mt. Vesuvius to the north-west, Cava dei Tirreni to the east, Salerno and its gulf to the south-east and Ravello with the Oscar Niemeyer Auditorium to the south-west. Outside is a large wooden table with benches where you can enjoy a pleasant snack on this terrace among the clouds, overlooking heaven. (May 28) - photo of the day 13 - Nunziatella military academy. The building, itself, goes back to 1588. 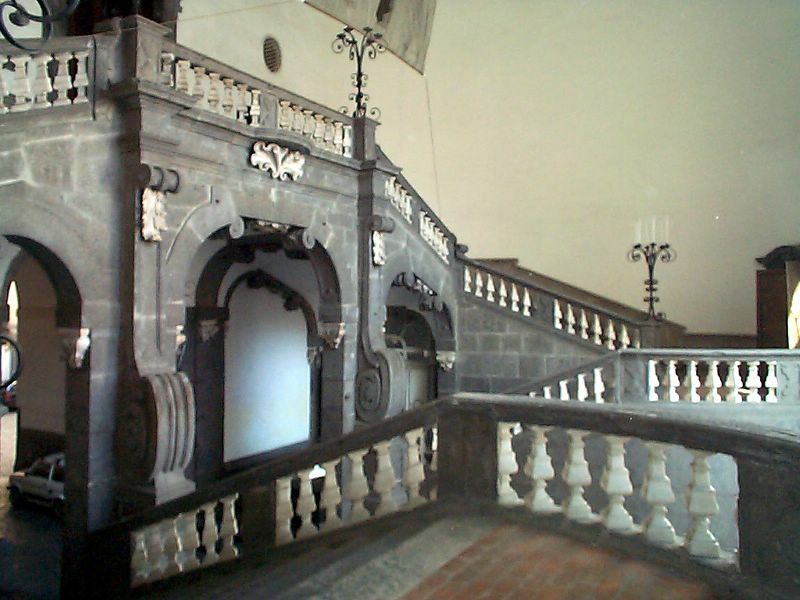 It was converted by Ferdinand IV in 1787 to a military academy to train the officer corps for the Kingdom of Naples. This photo is from album 1 at this link. Click here for a larger image and a link to the complete story of this institution. ...the need to create a link between schools and the labour market...[and to provide a place]...where the new generation was to be trained in...pottery, metalworking, cabinet making and gold work...enabling ongoing comparison between antique and modern articles and encouraging pupils to think about techniques...thus transcending the purpose of a mere collection. photos: both bottom photos by Fulvio De Marinis. (May 30) - photo of the day 14 - This may not look like much, but it's an active volcano— the Solfatara in Pozzuoli. At the moment it's idling in a scenic phase, somewhat like Yellowstone, but like Yellowstone there may be a super-volcano down there, according to geologists. It wouldn't be the first time. 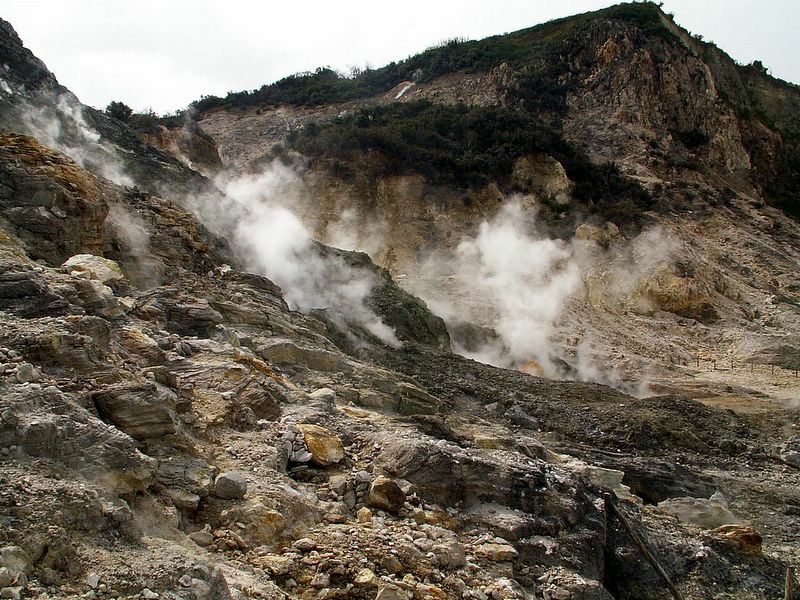 Solfatara is the ever bubbling sulfur pit at the center of remnant extinct craters, skewed hills and jagged upcroppings left over from the great Campanian Ignimbrite eruption of some 40,000 years ago. 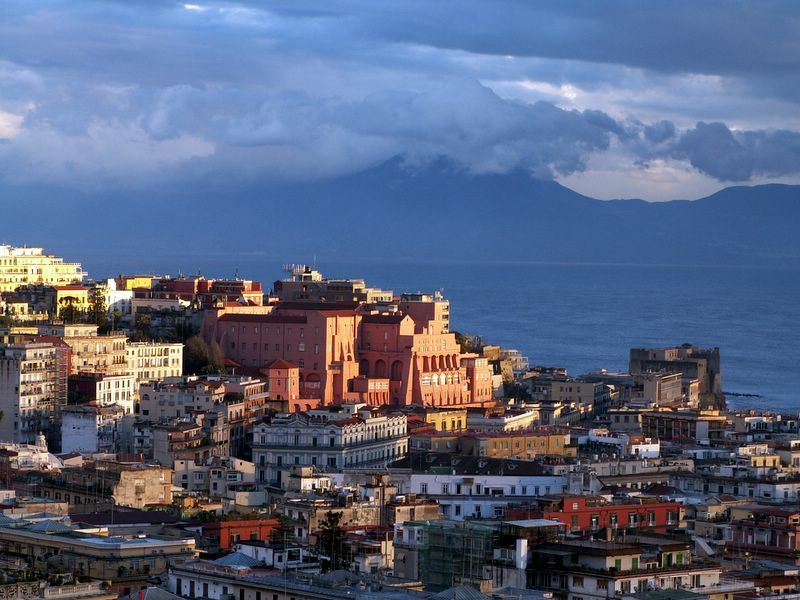 Today, that area is poetically called the Campi Flegrei —the Fiery Fields. Today Solfara is a major tourist attraction. This photo is from album 1 at this link. Click here for a larger image and a link to the complete story of the Solfatara. This photo is from album 1 at this link. Click here for a larger image and links to additional text on Sanfelice. (Jun 1) - photo of the day 16 - This is the south slope of the Vomero hill. It overlooks much of the city, including the main commercial port. The white building is the San Martino Museum; the structure behind it is the Sant'Elmo fortress. The greenery in front is the Vineyard of San Martino (see that link for a photo array of the vineyard), a vast park that now serves various environmental groups for one purpose or another, such as summer camps for children. This photo is from album 1 at this link. Click here for a larger image and links to additional text on the museum and the fortress. (Jun 6) - WWII journalistic curiosity. It should come as no surprise that when one nation takes over another, one of the first things the victors do is get the news sources— the radio and tv stations, newspapers, etc. Thus it was in early October 1943, when Allied troops moved into Naples after the Salerno invasion to replace the Germans, now rapidly retreating north towards the site of the next big battle, the approaches to Monte Cassino. This is why no one could go home. The issue from 14 October 1943, one week after the founding of the paper, headlines "Italy declares war on Germany" and beneath that, " Great Britain, the United States and the Soviet Union recognize Italy as "co-belligerent in the war against Germany." Italy was then swept up in civil war, since the Germans had set up a puppet Fascist state in the north. The incoming Allies declared all then existing local newspapers in Naples, i.e., Il Mattino, Roma and the Corriere di Napoli at least temporarily defunct, to be replaced by a single paper, il Risorgimento, a name chosen to recall the most famous phrase in centuries of Italian social and political history. Risorgimento (<== see link) means rebirth, resurgence, resurrection and is the name that Cavour gave to the newspaper he founded in 1849. He spoke of the need for a "political and economic risorgimento". The name stuck and became the name of the movement, itself, to unify Italy. The editors of the new daily were many of the same persons who had run the old papers; they just had new bosses, the Allied forces of occupation/liberation. 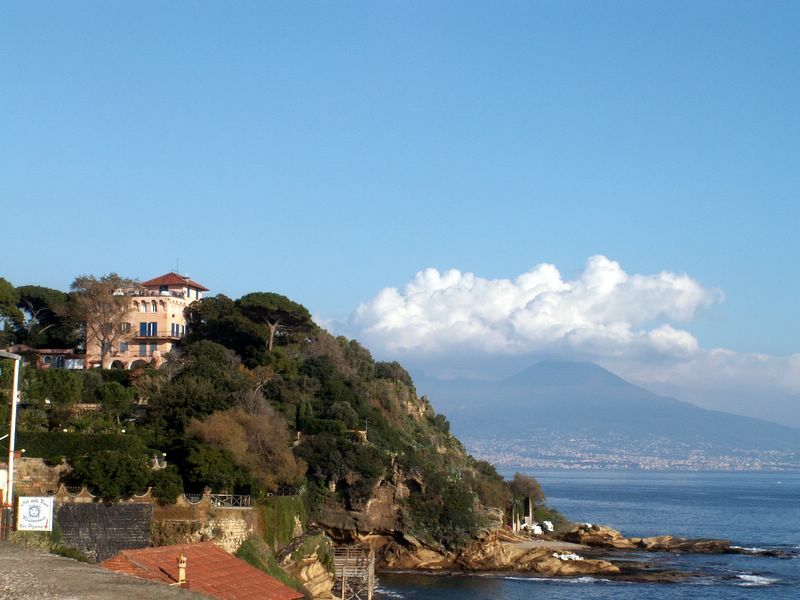 The principal owners, as before, remained the Bank of Naples and shipping magnate Achille Lauro. The paper was widely read in the south and from 1944 to 1946 had a daily circulation of around 290,000 copies. Il Risorgimento published until 31 October 1950, by which time all newspapers in Italy had been definitively returned to Italian civilian administration. 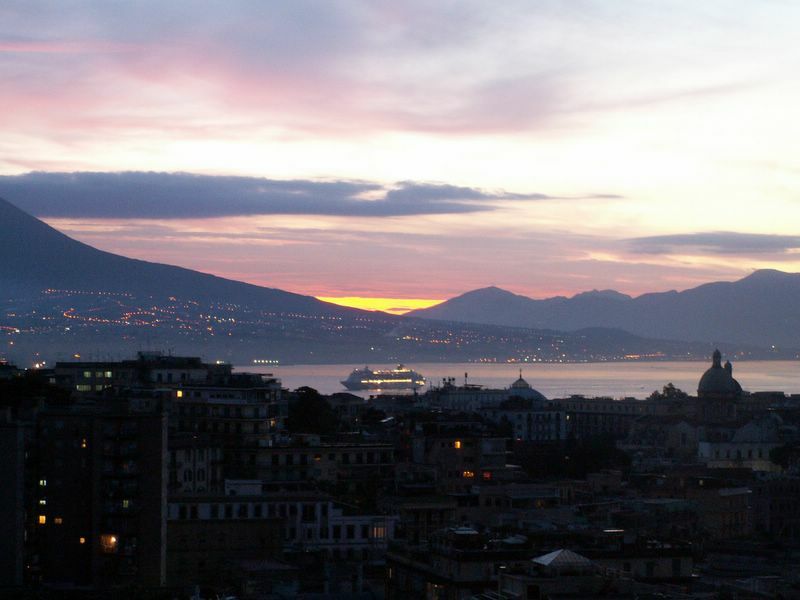 (Jun 8) - photo of the day 17 - Cruise ship calling at Naples at dawn. The season has started, and these behemoths call regularly at Naples —at the main passenger port of Molo Beverello, built in the 1930s to accommodate ships of that period, which could almost fit as life-boats on these new giants. They come in at dawn, sometimes two or three one after the other, strung out across the bay, patiently waiting their turn. This photo is from album 1 at this link. Click here for a larger image and link to a related article. (Jun 9 - cont. from June 6, above) - Just to show you how seriously I take the disintegration of Naples, I ran my Urban Attention Deficit Disorder idea by Warren, friend and hot-shot sociopath...iology professor. He said he thought I might have something. - "OK, I'll have it checked out." - "No, no. I mean you have an idea, a solid acronym, UADD,—always very important—and even a concept, but..."
- "But what?! So when do I start picking up royalties?!" - "...but you got no theory. And you might need a hypothesis, maybe even a hypoteneuse... but at least you need a theory that will explain various things about cities, not least of which is that they are never finished. 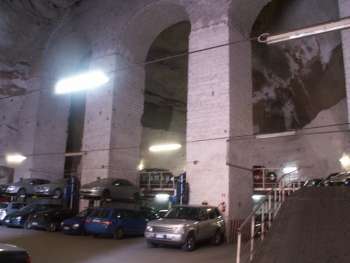 There are cities, like Naples, with memory problems that leave subways undone, tunnels to nowhere, bridges up in the air on both ends waiting for ramps to be built. Highways go unpaved, schools have broken ceilings, museums have displays abruptly abandoned. Mostly contractors move on to more lucrative deals or else go bankrupt. The construction site in your picture, for example, looks overgrown, like a long-lost Mayan temple." I reminded him that it actually was over a long-lost Mithraeum (a cave/church dedicated to the God Mithra), now a parking garage (pictured). - "Proves my point. Look how this all ties in. Take Ailsa Craig, for example. Please." - "You mean that stunning volcanic island, part of Scottish legend for a thousand years, whose quarries are the source of the distinctive, water-resistant microgranites used to make most of the world’s curling stones?" - "Indeed, none other. Well, it's for sale! Ever since Broomgate (the use of high-tech sweeping brooms to replace those used in traditional curling and by traditional Scottish witches), the island is the perfect (if obscure) example of UADD. Year after year something new is tried and then deep-sixed. The most recent example is Bobby Sandhu's attempt to build a 5-star hotel that had to be abandoned due to planning regulations!" - "Hardly...but because Ailsa Craig is a volcanic plug, it is almost on a par with the Temple Mount. Very orthodox believers think Mount Moriah is a plug, too. If it is disturbed, the entrance to the Deep will be exposed and all Hell will break loose. So, you hop down a hole in Ailsa Craig, poke your head up at Vesuvius, duck down again and turn up in Jerusalem. Your theory will have to deal with that." - "Forget Vesuvius. It's gotta be Ischia, the entrance to Hollow Earth." - "As it says in the Hunki Dori, Ischia-Shmischia." I am prepared to carry on, but first I have to lie down with a damp curling stone on my brow. This is the END of Miscellany page 61.